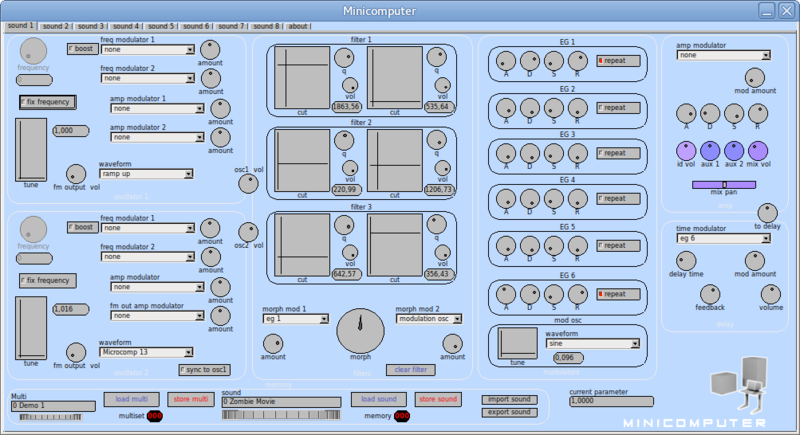 Minicomputer is a multichannel, multi-timbral realtime polyphonic software synthesizer, initially created by Malte Steiner for the unix platform, now currently maintained by Jean Pierre "jpcima" Cimalando. A curious synth that has remained outdated for over ten years, it has recently been improved and made available in the repositories of the LibraZik (version 2)audio production distro. Minicomputer is an 8-voice, realtime virtual sound synthesizer that utilizes one voice (sound) per page on an 8-page GUI layout, meaning that each page can reproduce a different sound entirely, similar to a drumkit arrangement. Each page has six basic sections for its individual sound: the Oscillator section, the Filter section, the Modulation section, the Amp section, the Delay section and the Memory section. The Oscillator section provides two oscillators with both 'classic' waveforms and some unusual ones, including eight waveforms utilized on a previously-released commercial synth called Microcomputer. The oscillators can utilize frequency modulation (the first modulation slot includes a "boost" button to increase modulation 100-fold) and amplitude moduation (the second amplitude modulator of oscillator two modifies the frequency modulation output). Oscillator 2 can hard-sync to oscillator 1. Both oscillators can utilize a fixed frequency, and discrete tuning is provided in an X-Y graph (horizontal movement detunes by octaves, vertical dragging will fine-tune). As with the other sections, there are also digital indicators to assist with precision adjustment. The Filter section includes three "double" filters: a lowpass filter and two bandpass filters, which can be morphed-between. There is also a dial to control morphing offset. A "clear filter" button is provided to reset the internal signal path if modulation becomes difficult to control. The Modulation section consists of six assignable ADSR-type envelopes and a modulation generator. The envelopes can be set to loop to obtain additional oscillator-type sources. The Amp section provides amplitude control through an additional ADSR envelope which is hardwired to the amplitude output. The Delay section provides assignable digital delay effect control. The Memory section has full load and save capabilities for both "multisetup" patches (which save all active voices in a preset) and single sound patches (which can then be loaded independently to build new multisetups). A manual is provided in the installation package, directly from the Librazik repositories.